Colin Fassnidge, chef in reality or a reality chef? This is an article from Good Food written by Myffy Rigby, that shines some badly needed light on just how brutal kitchens can be. It’s a tradition that even top chefs seem loathe to change, and it wasn’t until Colin himself couldn’t get anyone to work for him that he realised HE had to change. There are two sides to Colin Fassnidge. Viewers of My Kitchen Rules might be au fait with the Sydney-based Irish chef as a guest judge on the cooking show. Restaurant fans and kitchen voyeurs might remember his days at Banc, the Four in Hand, or his current venture, 4Fourteen. So is he the hard-arse, bad-tempered chef with one of the finest old-school kitchen pedigrees in the country, or the guy flashing the perfect pearly white TV grin, juggling tomatoes and playfully blowing soap bubbles at his co-judges, Pete Evans and Manu Feildel? Plenty might say the hi-def version of the man is winning out. Google “Colin Fassnidge” today, and the related searches might be “age”, “wife”, “family”, “height”, “teeth”, “wedding” and “born”. Not one of them is “chef”. Which is surprising, when you look at his CV. This is a chef who was brought up screaming, going from one violent kitchen to the next, experiencing the sort of mental torture that only the grand European kitchens of the ’80s and ’90s could provide. Kitchens back then could be violent places, but Fassnidge says it was the mental abuse that got you in the end, and Le Manoir was no exception. “The head chef at the time – I’m not going to name the name – wanted to get rid of someone. He’d just stand and scream in their face all day. Tell them to empty their drawers, throw the bins, drag them around by their aprons or whatever. It was a young girl and he just broke her. In the late ’90s, Fassnidge received a job offer from Justin North, a young Australian chef he had met at Le Manoir. 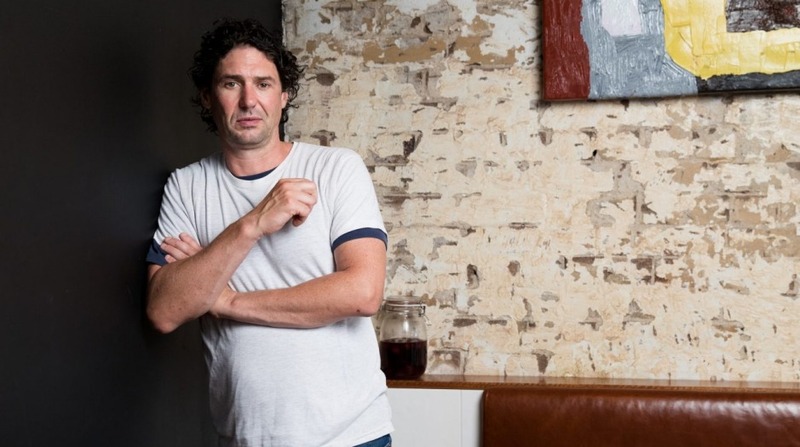 North had risen to sous chef at Banc, was recruiting for the Franco-British Sydney fine diner run by Irishman Liam Tomlin, a chef with a famously short fuse and a masters in bollocking. Fassnidge fitted in straight away. He was surrounded by a brigade of chefs who would all go on to open some of the most influential restaurants of their generation. Banc was the only kitchen Fassnidge had ever seen “where basically everybody could cook. The f—ing people you had in a line standing beside you! And everyone could cook a section”. Leaving Banc, Fassnidge ran Le Grande Bouffe in Rozelle in 2004 before opening his own place a year later, the Four in Hand Restaurant in Paddington. It was high-end British-style pub dining executed with all the care and elegance Fassnidge had learnt at Thornton’s, Le Manoir and Banc. In 2012, Fassnidge opened the more casual, diner-style 4Fourteen in Surry Hills. A year later, he became a guest judge on reality cooking show My Kitchen Rules. The realities of reality television has certainly changed daily life for the chef. Especially when it comes to social media. His Twitter, Instagram and Facebook are clogged with private messages from online trolls threatening him and his children – sometimes with things so disturbing he can’t even tell his wife. He says there’s nothing the police can do unless there’s a direct physical threat, so he’s had to learn to filter the noise. Who is Colin Fassnidge? He’s a chef who’s learnt to pick his battles. So true. And his behaviour was so bad, though, that he couldn’t find anyone in the industry to work for him! That’s why he closed his restaurant. Word travels fast.